PT Geo Dipa Energi (Persero) - Geo Dipa is well-established state-owned company in Indonesia, running business in geothermal energy. PT Geo Dipa Energi (Persero) has core business competencies in geothermal power generation. Its business include exploration and exploitation, power plant development and also energy distribution. Based in Jakarta, PT Geo Dipa Energi (Persero) now has 3 geothermal Existing fields ; Dieng in Mount Dieng Central Java, Candradimuka in Banjarnegara Central Java, Patuha Project in Mount Patuha West Java. 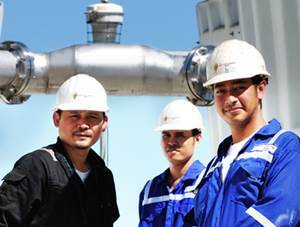 The Company's geothermal projects to serve the Java - Madura - Bali (JAMALI) transmission. The Company's head office is registered at Recapital Building 8th Floor, Jl Aditiawarman Kav 55 Jakarta Selatan 1216. According to Geo Dipa's company profile as cited by JobsCDC.com, PT Geo Dipa Energi (Persero) was established in 2001 as a joint venture company between national oil company PT Pertamina (Persero) and national electricity company PT PLN (Persero). In 2011, the company become a new state-owned company after PT Pertamina (Persero) donated all 66.67% of its shares to the Government of Indonesia. At present, PT Geo Dipa Energi (Persero) is 93.33% owned by the Government of Indonesia and 6.67% by PT PLN (Persero). Minimum 5 years of experience in the field of logistics/procurement (LAM). Minimum 3 years of experience in the field of geothermal (REEN, PPPES, CAS, SFMPS, SFMS). Holds around 1-3 years of experience in the related field (MOA, TLS, ABS). For the placement of the Office Unit Dieng preferably domiciled / graduated University in Central Java Region. JobsCDC.com now available on android device. Download now on Google Play here. Please be aware of recruitment fraud. The entire stage of this selection process is free of charge. PT Geo Dipa Energi (Persero) - D3, S1 Staff, Analyst, Engineer, Asst Mgr Geo Dipa July 2017 will never ask for fees or upfront payments for any purposes during the recruitment process such as transportation and accommodation.